Los Angeles, CA — At the end of September, a good citizen working at a construction site was surprised to discover a tiny kitten. The kitten was very small and dirty, and all alone. He brought the four-week-old kitten to spcaLA and today, she is available for adoption. The kitten – named Zaha after Zaha Hadid the world-renowned architect, was dirty, underweight and diagnosed with an upper respiratory infection. Zaha spent the next four weeks in a home with an spcaLA Foster Volunteer. 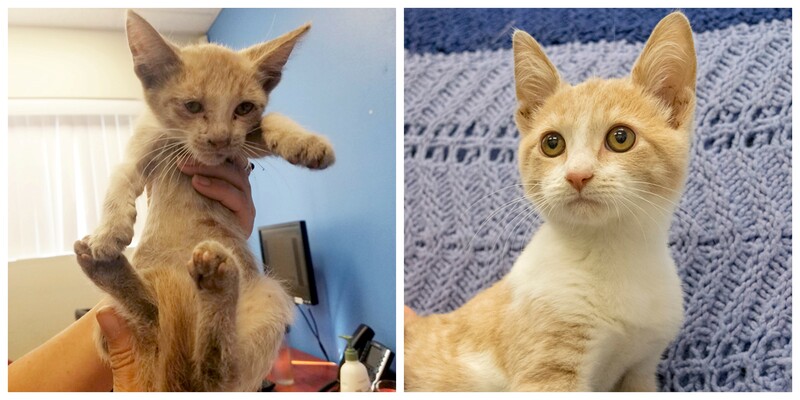 Today, Zaha is a happy, healthy kitten and ready for her forever home. Kitten season seems to have no end in the warm Southern California climate. spcaLA and other shelters are receiving and caring for hundreds of adult cats and kittens. Please adopt, donate needed items or funds, volunteer to foster, and spay and neuter pets. To donate, go to spcaLA.com or drop-off at any location during business hours. Anyone interested in adopting Zaha or any of her feline friends is encouraged to visit one of spcaLA’s pet adoption centers located in Long Beach, Hawthorne, and Pico Rivera. Info on locations, hours, and adoption fees available at spcaLA.com.